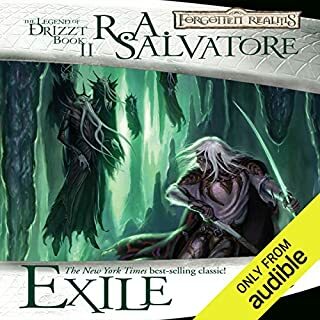 Drizzt Do'Urden has settled in the windswept towns of Icewind Dale. There, he encounters a young barbarian named Wulfgar, captured in a raid and made the ward of a grizzled dwarf name Bruenor. 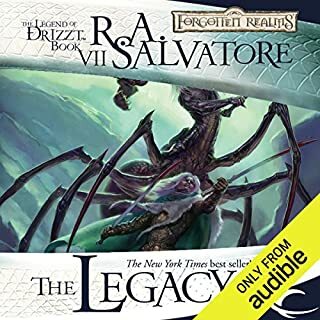 With Drizzt's help, Wulfgar will grow from a feral child to a man with the heart of a dwarf, the instincts of a savage, and the soul of a hero. But it will take even more than that to defeat the demonic power of Crenshininbon, the fabled Crystal Shard. 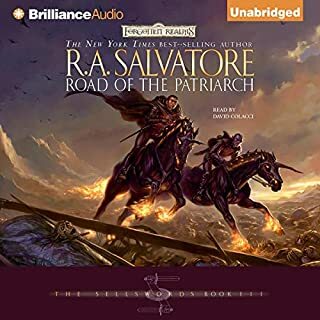 ©1988 TSR, Inc., ©2005 Wizards of the Coast, Inc. (P)2013 Audible, Inc.
R.A. Salvatore just keeps the hits coming. the Characters are real and thought provoking. The settings are what you would expect from Faerun, and the world of the Forgotten Realms. Welcome to Icewind Dale, a place harsh, and unforgiving. 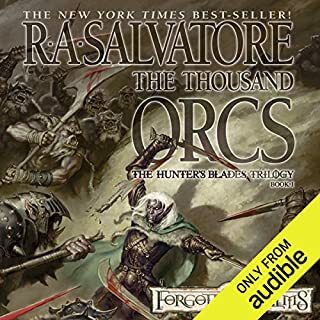 This book introduces us to new characters to care for and hear of the struggles of Dwarfs, Barbarians, Elves and Humans as they come together to repel a raging horde of baddies stirred up by a Magic-user. 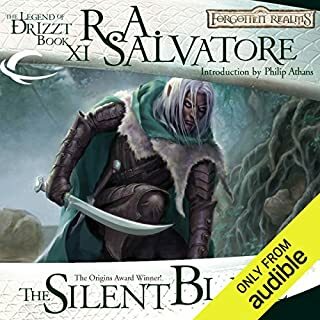 R.A. Salvatore's first Forgotten Realms novel that launched the legend of Drizzt Du'Orden, and his companions. Set beyond the spine of the world mountains in the frozen tundra in the Ten Towns the last settlement on Fae'Run. You first meet the Drow Ranger and his Uncharacteristic Dwarven companion Bruenor Battlehammer the king of clan Battle Hammer displaced Dwarves of Mithril Hall on the eave of a barbarian invasion that threatens to destroy the towns. This would be enough for a novel in and of itself. Salvatore uses this to introduce Wulfgar the Barbarian. Watch as they build their the companions their legend through the lens of a goblin invasion. 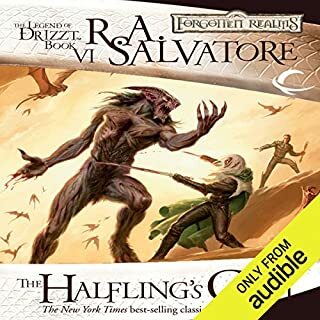 This is a must have for the fans of Drizzt. 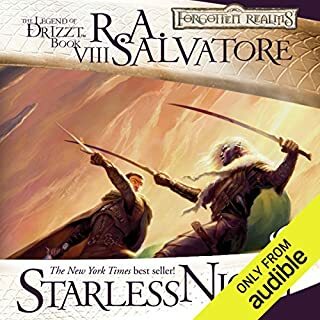 I listened to the first 3 Drizzt books, And now I am glad to find this new series that carries on his adventures with other heroic characters. I ignored these books back when I used to actually read scifi/fantasy, now I wish I hadn't, excellent yarns. 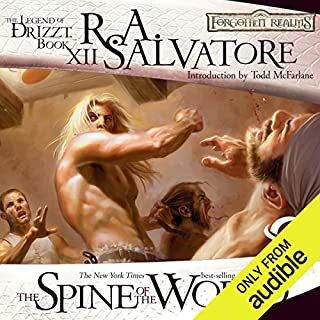 And by far, Bevine is the best narrator for the genre, not a fault can be found -- clear, good tone, his voice adds enthusiasm and excitement during exciting scenes, he does enough voice imitation for different characters to make it clear who is talking, but not corny either. And of course, the story was very good, else I wouldn't give it 5 stars. Highly recommended! I would definitely listen to this book again. Maybe two or more times. Why? Because the nonstop action and adventure. The way that Salvatore captures the world is profound and detailed and makes me feel like I'm beside the characters. My favorite character in this book was Brunner. 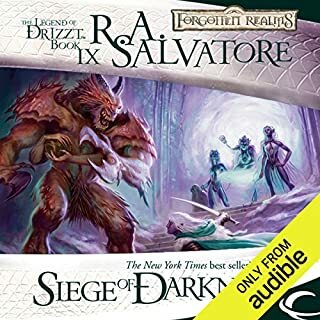 He is witty and stubborn and plays a good prank on drizzt. I couldn't help but laugh and smile whenever he was in the chapter. Victor Bevine is an awesome narrator. He makes each character feel distinguished and gives each the charm and/or personality as if he were actually that character. This book definitely made me laugh at several parts, as well as bite my nails or even feel disdain at others. Defiantly kept me at the edge of my chair. Good start. Not great but good enough. I'm writing this after having finished "Streams of Silver". I appreciate where the story is going and I like the overall effort and tone. The first half is a bit slow for me, but I liked the pacing in the second half of this book. The performance is good and enjoyable. I thought the core relationships are a little forced at the beginning of this book. Made me think about how most D&D parties feel a little forced as well at the start and how they need to grow into each other. If you like D&D fantasy tales, this is a good one that spans the gamut in short time. It sets up the next installment well, which I have enjoyed more than this one. not the best, not the worst. really a 3.5 for me. it's a earlier work, so not as fun as some of his later books. 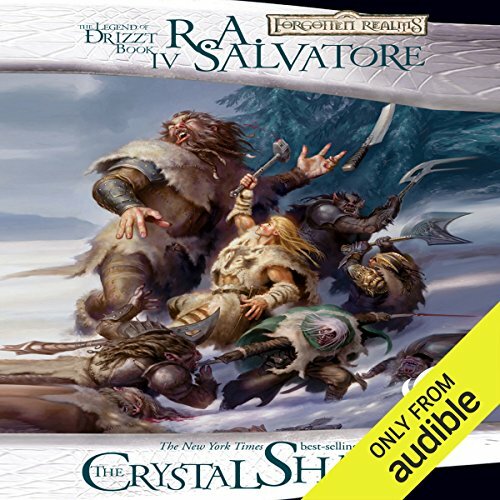 Where does The Crystal Shard rank among all the audiobooks you’ve listened to so far? 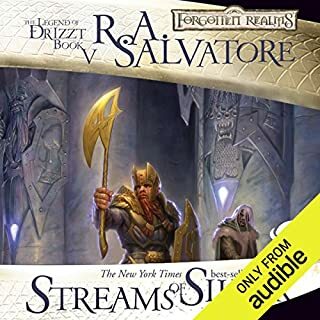 Like most folks, I really connected with Drizzt. I think many of us have moments where we feel like singular bastions of decency in a world that needs fixing. He is unwaveringly loyal and has a strong moral compass - I can get behind a character like that! 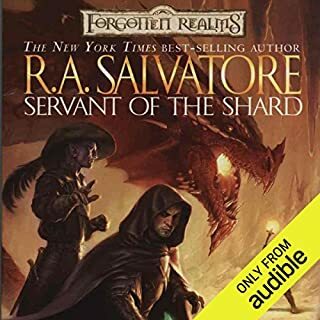 I truly enjoyed Mr. Bevine's voice talents for the various characters, along with the ease applied to speaking unusual words and names that are frequent fare in the fantasy genre. No, but that didn't make the story any less enjoyable. i had high expectations for this and it did not disappoint. 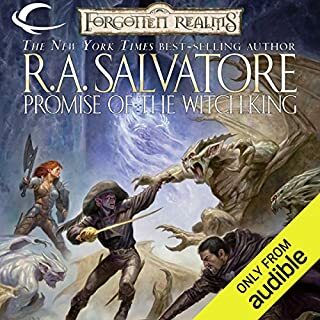 I enjoyed Salvatore's writing style there was not too much fluff. 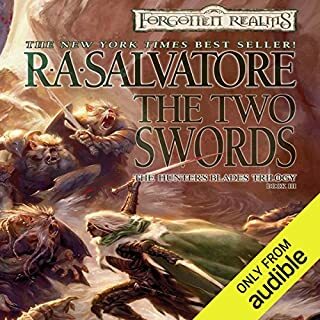 There was a time when R.A.Salvatore was one of my favorite fantasy authors. 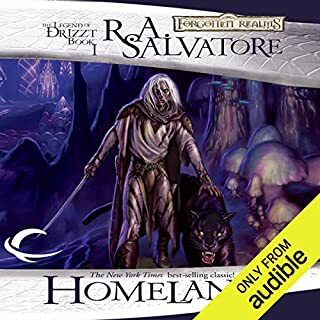 I even had him autograph my copy of "Homeland," his introduction to the Drizzt character, which was riveting and original, set as it was in the Underdark where we were introduced to an entirely novel culture of shocking matriarchal cruelty and the Spider Queen goddess of the Drow elves. 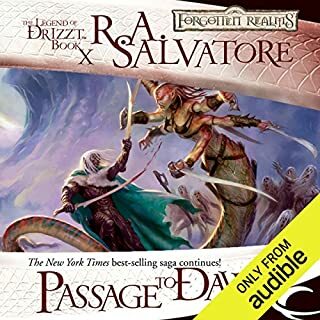 Somehow I missed moving on to his second Drizzt trilogy, so I was looking forward to picking up the tale now after all these years. Unfortunately I found that the old school world of frost giants, dwarves, hobbits and barbarians suffers somewhat in comparison with the deluge of imagination and creativity to which we have been treated in the past thirty years. 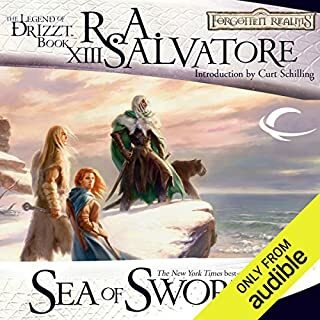 I wish I had read "Icewind Dale" when it first came out so that I could have enjoyed it without having to compare it to Sanderson and Abercrombie and Bujold and Lynch's Locke Lamora and, yes, R.R. Martin." Still, I enjoyed traveling with the old companions again for a few hours. Though I find Victer Bevine's delivery to be a bit wide-eyed and labored, he does maintain the energy of the work and delineate the characters clearly. 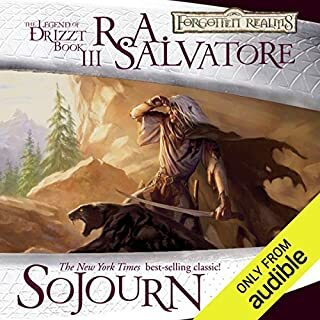 Though I will not follow the rest of the "Icewind" series, I'm glad I got reacquainted with Salvatore, and I may check out some of his more recent works to see how he has responded to the development of the fantasy genre. I could not get into this despite having enjoyed the free Drizzt anthology with the various performers. It felt like the narrator was simply just reading the book. It took me out of the book which wasn't that great to begin with. Lasted maybe 5 hours until I just did not care anymore. Perhaps, it's a basic story. 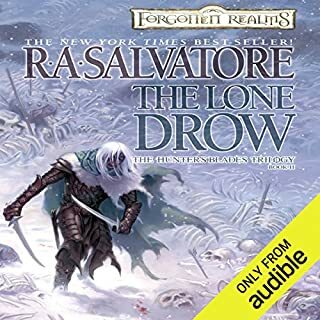 Drizzt and his friends are far too powerful with lots of plot armor. The enemy was cliche.